A walk though Edmonton’s river valley in the fall brings alive the beauty of God’s creation as the transition from summer to winter brings a beauty that is unmatched. Yet many of Edmonton’s homeless have come to call this river valley, “home.” They live within the bushes seeking shelter underneath the canopy of the trees. They live invisible to most of us here in the river valley, hoping that their shelters in the woods will go undiscovered so as not to be evicted from their homes. Those who live on our streets will tell you they feel like they have become invisible to the rest of society. People go out of their way to avoid them. “Those people” are deemed “less desirable,” as if their worth and dignity are directly related to their mental health or dwelling place. One of the hardest transitions for most of us to make is the movement from charity to solidarity. Charity allows us to stay in a vertical relationship with those on our streets. It keeps us standing above and reaching down to those in need, keeping a distance between us when what we really need is to be brought closer together. 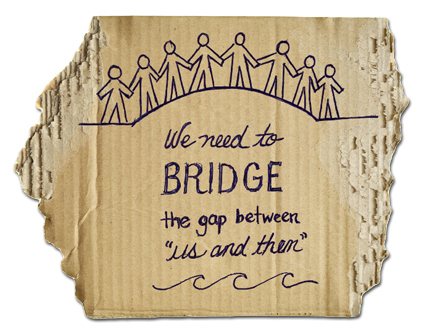 We need to bridge the gap between “us and them,” to recognize that for us to live fully we need each other. In Genesis 1:26–27, we are told that God created all of humanity in his image. The implication of this truth should shatter the culture of “us and them” that we have established, while opening us to the gifts that others have to offer to us. When we decide not to see God’s image in those we deem less desirable, we choose not to see God’s image in ourselves. 1. Do you know where homeless people live in your city? Have you ever gone out of your way to avoid them or evaded their eyes as you walked by? 2. What is the difference between charity and solidarity? Can you identify which attitudes need to change for you to move closer toward solidarity? Kris Knutson is Executive Director of the Edmonton Do Likewise Society (EDLS) and The Neighbour Centre. In response to the increasing needs of homeless and marginalized people in south Edmonton, EDLS build relationships and nurtures hope, health, and personal transformation. Kris has served with The Mustard Seed and the Community Correctional Chaplaincy program, bringing with him his heart and passion to see individuals and communities transformed through God’s people.